Thinking about Scott’s word cloud, I was inspired to do two things. First, I went through the list of people I follow on Twitter and deleted those who only promote themselves, their blogs and their webinars. The people who only use Twitter to talk, and not to listen. Case in point: a self-professed VO “guru.” The largest words in his Twitter word cloud include “Class,” “Starts,” “Workshop,” “Today” and “Coaching.” Many of his tweets include affiliate links (though he doesn’t point out that he’ll earn money if you click and buy the products/services he mentions). A little further investigation reveals that this vo “expert” follows fewer than 10% of the people who follow him, making it clear that he’s only interested in broadcasting his message, not in meaningful conversations. Next, I wanted to see what my Twitter word cloud would look like (click the image above to get a better look.). You can check yours, too. Just go to Tweetstats.com, enter your Twitter username, then click through to Wordle. Edit: To hear Scott explain his views in his own words, check out this YouTube video I just found. Eye opening blog Doug. I’ll have to read Scott’s book. This is great Doug. Thanks! I checked tweetstats out. What a great discovery. 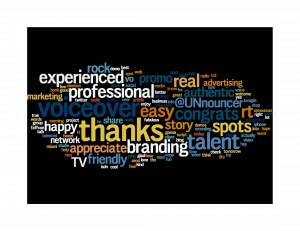 Fortunately “thank you” is one of my larger words as well, along with “voiceover”, my website URL, and the word “good”. Hey, Stefania, thanks for stopping by…I’m glad that you liked Tweetstats.com, and I’m not surprised at all that “thank you” and “good” were some of the larger words in your cloud. Great article, Doug! I definitely need to rework my Twitter strategy (more like haphazardry). Part of my problem is that I don’t have much time, so I mostly just toss out the occasional odd thought that comes to mind with the hope that it will lighten someone’s day for a few seconds. I’m taking a look at my stats now, but while I’m waiting for that to come back, I wanted to point out that the YouTube link you added at the end isn’t working. It’s pointing to some convoluted link on your own site. Looks like it might just be an errant paste or something. Thanks, Justin, and I know what you mean; Twitter (and all social media, really) can be a huge time drain. Plenty of people claim to be able to show you how to monitor and/or interact on Twitter in 10 minutes a day, but I’m skeptical of such claims. For me, it’s more of a “when-I-have-a-free-moment” kind of thing. I’d much rather spend that time actively marketing myself, but Twitter et al are a small part of that effort, so I don’t see it as time wasted. And thanks for the heads up on the busted link…it’s all better now! As for your stats, as I told Stefania…no surprise! And as far as the “finding time” question…I think we find the time to do the things we WANT to do…or that we prioritize (though admittedly, it can get away from you). Dave, you’re right, it’s always nice to find another member of the “UN” brotherhood! ; ) But my appreciation of Scott’s work goes well beyond his cleverness. He’s a bright, engaging guy who really “gets it” in a way that few others seem to. And yeah, Wordle.net is exactly what I used to create the graphic that accompanies this post. And anyone visiting the site should be warned, it can easily become one of those “time drains” that Justin referred to! By the way, I just picked up the book based on your blog here Doug and so far it’s very eye opening. I tried the tweetstats and found I need some improvement but am thankful that “Thanks” was one of my big words on my cloud. Thanks for this post, I’ve found it EXTREMELY helpful. I’m happy to hear that you picked up Scott’s book, and I’m sure that you’ll find the rest of it eye-opening as well. His perspective and his style are refreshingly down-to-earth, and they make so much sense (at least to me they do). I’m glad that you found the post helpful, and I really appreciate you taking the time to comment. I hope to see you at FaffCon! Previous post: The Mecca of Microphones?